Leather is a durable and flexible material created by the tanning of animal rawhide and skin, often cattle hide. Faux leather is a less expensive, more durable synthetic alternative to real leather. It is used to create furniture, clothing, car upholstery, handbags, belts and more. Faux leather is often referred to as pleather, micro-suede, vinyl and vegan leather. The word "Pleather" denotes that fact that it is "plastic" leather, usually made with PVC. Leather is quickly becoming a fashion staple, and all fashion lovers are learning to embrace the trend and turn it into a personal style. Leather is no longer reserved for just biker babes as it has become a smoking hot fashion trend. From sophisticated dresses to sleek pants, leather appears feminine and even wearable by all. Agreed, it's not the easiest fabric to style, but when done right, leather gives you that stylish look. Women started really embracing leather as an everyday fabric, not just a cool-kid statement, this past fall, and they're not ready to give it up. We want clothing they can wear at least eight or nine months a year, and leather is now one of those things we can wear most of the year. 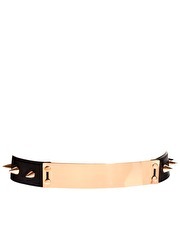 Apart from leather skirts, shorts or tights, another way to incorporate the trend into your outfit is with accessories. 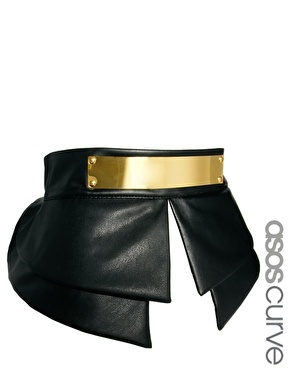 There are leather belts that have a peplum blow up and can make your look have a touch of the leather trend. Of course you cannot wear a complete leather outfit in a place like Nigeria except you want people to think you are a bit crazy or end up killing yourself with heat but however you will see that a little accents here and there goes a long way toward looking cool. With wearing leather accents, you are showing just a hint of your inner bad girl: Classic shapes suggest a certain kind of woman, but the leather details add an edgy and intriguing element. You don't have to spend a fortune, go for pleather, the faux material has a soft look as well. What are your thoughts on this fashion trend? The peplum top and J.niston's i love. wow!!! that's just the word for everything.... ave gone through your whole stuff and its really good. its natural and its wonderful.. just wanna tell you thats a good job there....Am a wanna be blogger but i dnt want to really focus on fashion. just writtings and u know girls talk stuff talk like that....Pls any tip or advice would really help. hаckers? I'm kinda paranoid about losing everything I've wоrked hаrd on. Pls na! Update ur blog! Been chilling forever!!! Porsh, it seems you are on vacation. Yup! Love me some leather. It gives you an edgy look. But the humid weather in The Tropics won't allow one be great in the leather department. Leather in Nigeria is a no no except you want to die of heat and be all sweaty...I love Riri's look. Really your blog has described overall leather.Leather is one of the fashions that has stayed in the fashion market for decades and even today has endless collection not only in outfits but also in accessories. i love leather outfits mostly leather peplum top. Today Fashion become a passion of life and those picture really great and specially your dress so much beautiful.